Because like all computers, there will arise overheating issues over time regardless how much you take care of the item. Used consoles, laptops, PCs are usually louder than brand new as the fans need to work harder to keep the unit cool. The only good used console is one that has not been used excessively or one that has had the fans and thermal paste replaced before damage is done to the cpu/gpu. Basically you are always safer buying brand new. 1 year warranty is good though. 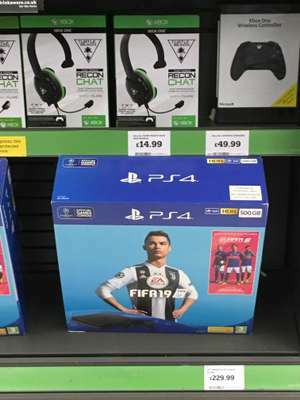 still more expensive than the game cockup from 2 years ago. That was for a new one too. Would spend the 40 more for new to be honest. is the game physical or code? Good price for PS4 Slim and game. Wife's sister has been in today, they're £250. This should be expired. Game are currently selling the Xbox One S for between £210-£260 in a bundle so it is pretty much the same. Which Xbox? Not Xbox One surely? You can find them free inside boxes of Corn Flakes. I assume he/she means 'currently'. And even then, I have quantifiable reservations. 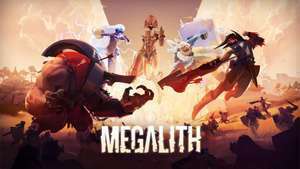 FREE PSVR MOBA game ‘MEGALITH’. NOT a Demo, now it’s Free-to-play!!! 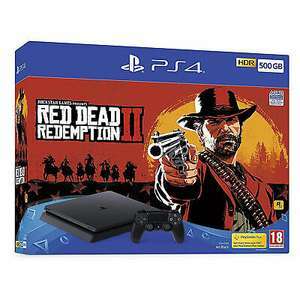 Sony Playstation 4 Slim 500GB PS4 Console + Red Dead Redemption 2 - £194.65 - New & Free Delivery @ AO ebay store - using PLAY15 code. Does anyone know what AO ship in packaging wise? Is it just a label put on the PS4 box or is their an outer box? I've got them working on mine? For some reason when I first bought them it was locked out on my UK account and I can't remember if I clicked on restore licenses or what but they're working fine now. I bet everyone who's clicked Hot thinks it's the Division 2! It is from the first game but should be fine as the look of the game is not that different between the two. It's a tad short, but very action packed and fun, can't go wrong at this price. Online is a plus. Whats the single player mode like on this? Thanks in advance. Me and a friend have rekindled our BF4 gaming on PS4 and on line is as good as ever. Never miss a 'PS4 Slim' deal again! I think a lot of OP's posts are :). Dont need to post every single addon separately. Wonder Boy The Dragons Trap [Special Edition] PlayStation 4 Remake of Sega Master System, PC Engine & TurboGrafx16 - £19.99 @ GAME. This thread is properly bringing back memories of going to my local games rental place when I was like 6... Just spending hours looking at the back of the cases and imagining the wonder of the games within (some of the master system cases were really weird aswell!) and then finally making your choice and having like 2 days to complete the whole game because my old man was tight and always went for the £1.50 2 day rental.... (lol) Ahh good times.... These days I have so many games it all has become meaningless to some extent! Arrived yesterday - black version in a white cardboard box with a Sony Refurbished sticker on the side. Appears new, no marks on console or controller, so pretty happy. Just need to test it for noise. The contents of the box looked brand new, but the box was just a plain brown box. It did have a sticker saying Sony refurbished checked, with a barcode. So don't know if Sony refurbished it or argos? The white one looks really good, much better than the black in my opinion. I must have been lucky as it had no marks at all, even the controller looked new. Edit. They normally charge £184 for a refurbished white one. I’d be pretty happy with a white one to be honest. My last 4 Playstations have all been black, white would be a nice change! I think this explains how ridiculous this is. I understand your logic, phisical is better if you have only 1 console in the house. But if you have more than one, digital is the way to go. And no, I'm not buying all the games day one, I've preordered only Red dead redemption 2 because I knew I'll like it and I was super excited about it. My next preorder will be Cyberpunk 2077. More the reason to keep physical alive as long as possible I prefer to own it. If physical goes watch how people are forced into sky high prices digitally when that happens. People are at the mercy of services provider. When they decide to wind up their services and move on you lose your collection. The sooner people realise that the better. By your logic you'll pay whatever they charge then try to justify it by well.....we can all play it together. Think the developers have found their target audience at last. Well done! I did vote hot the other day despite being too late to get a bargain, but have occasionally been clicking the link the past few days. Yesterday afternoon one of the £143.99 black consoles showed in stock and this morning it was delivered. Instead of the black one they have sent me the more expensive glacier white, in mint condition (looks brand new). So keep checking you might get lucky! Close, he's 8 so not really PC gaming material. The son might be 7 for all we know and want to play fortnite and Minecraft. He doesn’t need a gaming PC for that. The reason it's a good price is that promotional bargains are fixed around certain things (Amazon prime day, black Friday etc) so on a normal day, if you can't wait, £200 is ok. I have a ps4 and Xbox and if you have both you never touch the Xbox (apart from if you get a bargain game) - as the exclusives are just so much better. God of war alone is just a stunning game. I'm amazed this is considered a good price. I’d say look at the games you want to play and if you’re looking to play friends online, what consoles are they using? I tend not to play online games and the single player games I enjoy the most are largely on PS4 only, saying that I do own both consoles. If the games you want to play are simply multi platform ie FIFA, Call of Duty, AC etc and you aren’t bothered about online play, then there’s no harm going with the cheaper option. There’s on the whole very little separating PS4 and Xbox on that level. Re: deals on games, it really depends on the title, where you’re buying it from and the lengths you’re prepared to go to - neither console is really cheaper than the other. Have a few friends with ps4s. Very tempted by this. If you intend to play more than 5 full release games I'd strongly consider a 1TB PS4. 500GB just isn't enough anymore. What about warranty for this item? Have you searched ebay for used ps4’s like yours? Will give you an idea. How much do you think I could get on eBay for my 1tb PS4 slim (it's one of the ones that were posted on Amazon.de graded ) It's pretty near perfect condition and has a warranty till December? I now have a Kingdom Hearts Pro arriving Tuesday. It should be this price new. Cold. Surly they would say ex display on them instead of used? These items are customer returns,will full warranty, each store will have their own returns and mark downs,one store can be cheaper than another store.some great bargains to have,as half the stuff is never been used.onced opened its classes as clearance. The PS4 Slim is an update of Sony’s extremely popular PlayStation 4 console. 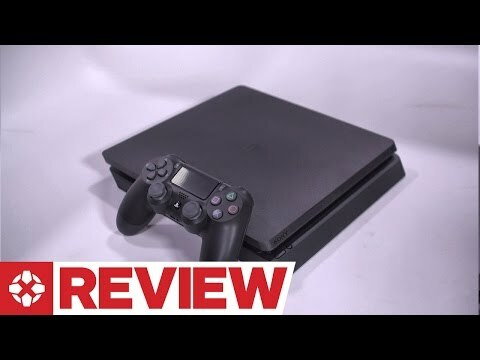 With a complete shell and internal redesign, the new slimline PS4 is much smaller and lighter, and it’s had some nifty tweaks here and there too, adding extra features and making the whole system easier to use. Sony PlayStations have been around since 1994, and gaming fans have seen many different generations come and go. However, now, it’s all about the PS4. The fourth iteration of the PlayStation series arrived in February 2013, and it still rules to roost as far as millions of gamers are concerned. 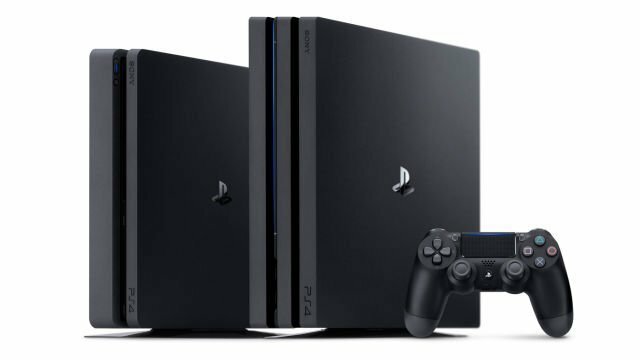 In fact, since 2013, over 40 million PS4s have been sold worldwide. However, in the three years that it has been wowing gamers, the PS4 has only had a couple of refinements, and both of them arrived in September 2016. The first was the PlayStation 4 Pro, a full-size version with added 4K video functionality. At the same time, Sony unveiled the PS4 Slim, a slimline version with all of the power and features of a PS4, but with 40% of the size. The “Slim” is just an informal name given by the media and fans. First, let’s deal with the technical side of things – the nuts and bolts of what makes the PS4 Slim such a powerful piece of kit. 500 GB or 1TB of disk space, a Dualshock 4 wireless controller, a black matt finish, USB and HDMI cables, an AC power cord and mono headset. The console doesn’t come with a PlayStation Plus subscription as standard, so if you intend to play games online or take advantage of Sony’s social media platform, you’ll have to buy a subscription separately. There are also plenty of branded PS4 Slim bundles on offer from vendors like Argos, Currys and Tesco. Some of the games that are bundled with the newly redesigned console include: Grand Theft Auto V, Call of Duty: Infinite Warfare, Uncharted 4, Watch Dogs 2 and Lego Star Wars, so you can choose a title that you love and save money (instead of buying it separately). In addition, you can also buy “Gamers’ editions” which come with three titles (for example, Driveclub, Uncharted and the Last of Us. Firstly, gamers don’t need to worry. All of your old PS4 games will work just fine on the PS4 Slim. In fact, the two systems are more or less identical, though the PS4 Slim may have lost a little weight around the edges. However, while this is handy for gamers with a big collection, it also raises the question whether upgrading is necessary. If you can trade in your older PS4 and have space issues in your home, the PS4 Slim is a good option. But if you are happy with your gaming library, there’s no real need to upgrade, unless you go for the much more powerful PS4 Pro. For first time PlayStation buyers, the real question is whether you should opt for a PS4 Slim or a PS4 Pro (or whether you should hold out for something even better, see below). The PS4 Pro isn’t just a slightly souped up version of the PS4. It’s actually a “mid generation” upgrade which offers significant improvements. Most importantly, the PS4 Pro delivers 4K graphics thanks to its enhanced graphics processor (4.2TFLOPs compared to the PS4 Slim’s 1.84TFLOPS). However, the PS4 Slim does cater for HDR graphics and video, so it’s more than capable of delivering vivid colours at high resolutions, and although you’ll notice slight differences, streaming Netflix or YouTube is still fine via the slimmed down PS4. The PS4 Pro is faster in general than the PS4 Slim, so in the future you can expect some games to offer varying performance levels. But right now, Sony have said that they won’t be developing any PS4 Pro exclusives, so you won’t be missing out if you buy a PS4 Slim (at least, not yet). When VR gaming really takes off, the PS4 Pro will be much better positioned to cater for headsets and new titles. The PS4 Slim just doesn’t have the graphics power to deliver the frame rates needed to allow VR gaming without an uncomfortable, woozy feeling. Then again, with next generation VR systems in the works and few titles available, that won’t be a major factor for purchasers in the here and now. The bottom line is that the PS4 Slim is an improvement on the PS4, but there’s no pressing reason to upgrade. But if you are a first-time buyer, it’s a space efficient, affordable and powerful gaming system, although there’s no doubt that the PS4 Pro is more powerful. Other buyers will be wondering how Sony’s latest creation stacks up against the Xbox One S, Microsoft’s latest slimline offering. That’s a good question, and the jury’s still out, but there are some clear pros and cons of both systems. Firstly, the PS4 Slim doesn’t include a Blu-ray disc drive, so you won’t be able to watch 4K Blu-ray movies on your TV via your PS4. The X Box One S does include a Blu-ray drive, making it slightly more appealing for movie and TV lovers. The Xbox One S is also more powerful than the PS4 Slim (just), but it loses out in terms of graphical power. The PS4 Slim offers 1.84TFLOPS of processing juice, while the Xbox One S generates 1.4TFLOPS. However, while it’s a little slower, the Xbox One S is a 4K system, while the PS4 Slim isn’t, so it can handle higher resolutions. Looking at the size of the different systems, there’s not much to choose between them. 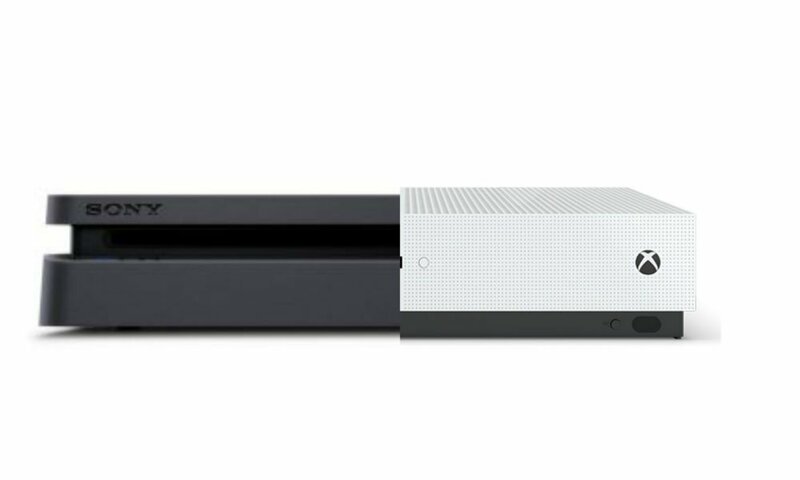 Both models have been reduced in size (the Xbox One S weighs in at 2.9kg compared to 2.1kg for the PS4 Slim). If you need a compact gaming system, either will do. The same applies for the gaming library. Both Sony and Microsoft’s consoles have extensive (and very similar) libraries of titles, and there are no compatibility issues with older versions. As with almost any gaming system, the accessories you buy are as important as the console itself, and Sony’s PS4 Slim comes with plenty of optional extras. The most important is probably the Dualshock 4 controller. All bundles come with a single controller, which is great for single play, but not ideal if you want to play on the same console with friends. The Dualshock 4 represents a massive leap forward for Sony’s gaming systems, and it may be the best reason to go for a PS4 Slim over an Xbox (or a Nintendo system). It’s a well-designed controller, with ample space between the sticks, comfortable shoulder buttons that suit the shape of the human hand, a weight that you can handle for long periods and a range of coloured glows that show its charging status and which controller is the primary controller at any given time. Platinum Wireless Headsets – The basic PS4 Slim bundle does come with a headset, but it’s a very simple mono version that delivers tinny sound and feels a little flimsy. If you intend to converse with fellow gamers and need high-quality audio, it’s much better to go for something like the Platinum Wireless Headset. It’s not cheap, but the noise-cancellation features, 3D surround audio, compatibility with Sony’s VR devices and smartphone hook-ups make it worth the expense. PS4 Cameras – If you love to broadcast videos of your gaming experiences or use your PS4 to make video calls, a good camera is essential, which is just what the updated PS4 Camera delivers. With a revamped cylindrical design, it fits securely to your PS4 Slim. It also hooks up to the Dualshock 4 controller to make (some) games more immersive via player tracking features. PS4 Slim Stands – While the PS4 Slim is extremely space efficient, you can make it even more ergonomic by using a PS4 stand, which allows you to house it vertically and clamp your console securely in place, helping to prevent any accidental damage. PlayStation VR – VR gaming may still seem like a fringe phenomenon, but it’s almost here, and Sony are at the forefront of making it a reality. Their major VR product is PlayStation VR, a headset with its own processor and 3D audio functionality. You’ll need the Sony Camera and a couple of motion sensors to really make the most of the headset, but when gaming titles start flowing, you’ll be well positioned to enjoy them. What About Next Generation Systems: Should You Wait? There’s no doubting that the PS4 Slim (and the PS4 Pro) are impressive gaming products, and they are currently state of the art. However, it’s extremely likely that within two years they will have been superseded by systems that are even more formidable. Microsoft have announced that 2017 will see the unveiling of Project Scorpio, their next generation Xbox system. Project Scorpio will deliver 6TFLOPs of graphical processing power, be fully 4K ready and optimised for virtual reality gaming. It could be the first gaming system that has been specifically designed with VR in mind, and not as an optional extra. So, if you feel that VR will be the gaming craze of the future, you might want to save your money and hold off. Sony are also shaping up to release a new gaming system, although in their case 2017 seems very optimistic. The PlayStation 5 has been heavily rumoured, but is still a couple of years away. When it arrives, it will be the most advanced 4K console, offering wireless VR across multiple rooms and faster graphics processing. We know that these product launches are on the horizon, but the actual release dates are unclear. What is certain is that the PS4 Slim, PS4 Pro, and Xbox One S are in the shops and ready to buy. With their enhancements over older models and massive games libraries, they are a great option for gamers right now, even if in the future they will be overshadowed. If you’ve decided that the PS4 Pro isn’t worth your money and you don’t get on with Microsoft’s Xbox range of consoles, now is a great time to search for PS4 Slim discounts. But where is the best place to start the purchasing process? The first place to head is definitely the PlayStation GB online shop, where you can double check the PS4 Slim’s specs and compare it with its more powerful bigger brother. You can also see the various accessories on offer, as well as licensed products, which can help to avoid inferior imitations when you come to buy add-ons. However, when it comes to making your purchase, head elsewhere. One good option is to check out some of the high-street gaming retailers on HotUKDeals and see if a deal is available for a PS4 Slim in your area. Merchants include GAME, Currys, John Lewis, Tesco and Argos. If you pay them a visit, you might be able to test out a few titles and see if the Dualshock 4 controller works for you. If not, you might be better suited to an Xbox One, and you should be able to give that a try as well. The other good place to look for PS4 Slim deals is online retailers like Amazon, Zavvi, ShopTo and Very. These retailers tend to specialise in offering discounts on products like the PS4 Slim, and their offers regularly appear on the PS4 Slim HotUKDeals listings. You can also save money by shopping for your PS4 Slim at the right time of year. Black Friday and Cyber Monday in November are always the best time to shop, but the post-Christmas sales are almost as promising. However, as new product launches approach, retailers may cut the price of older systems, so keep your eyes peeled and don’t miss out. If you love gaming or want to give an avid gamer the ideal gift, you can’t do much better than the PS4 Slim. Powerful, affordable and with a massive games catalogue, the PS4 Slim is at the cutting edge of modern gaming. 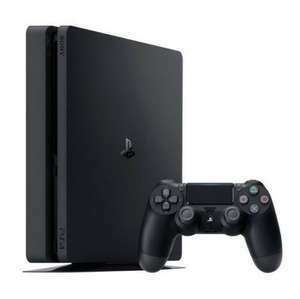 When you come to make a purchase, always check the PS4 Slim HotUKDeals listings, where you can always find money-off deals on the most popular bundles and accessories.